Kelli Grese: From an above average sailor, to prescription drug addict, to madness, to suicide. 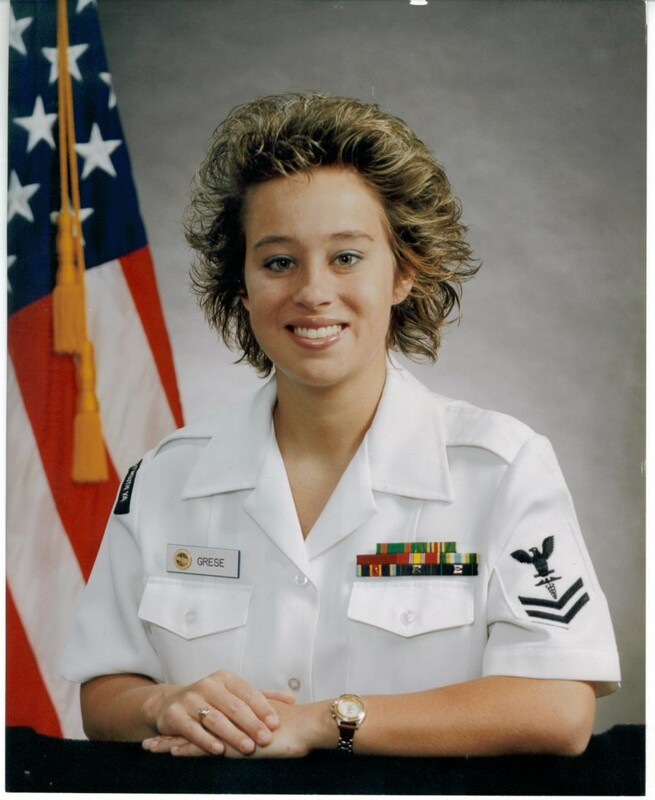 For six years, from 1991 to 1997, Kelli and Darla served side by side in the U.S. Navy. 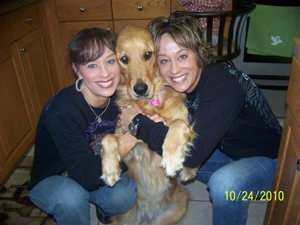 In 1995, while serving in Naples, Italy, Darla and Kelli were the victims of a home invasion by three men. Although they were physically unharmed, a PTSD diagnosis was in place – the diagnosis that would trigger the VA to prescribe more and more addictive psych drugs, the diagnosis that would lead to Kelli’s ultimate drug addiction, and, finally, her suicide. 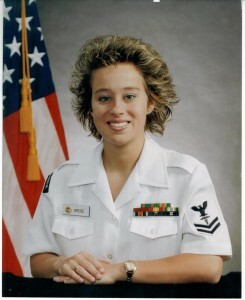 Following the break-in, and the PTSD diagnosis, Kelli continued to be a highly functioning, exceptional sailor: Her evaluations were superb; she was nominated for Junior Sailor of the Quarter at the end of her career; she managed and participated on the command color guard team; she had outstanding scores on her physical readiness test. Over the course of Kelli’s treatment with the VA, she was diagnosed with major depression, bipolar disorder, PTSD, ADD/ADHD, Polysubstance Dependence, and Borderline Personality Disorder. And then, following Kelli’s discharge from the Navy (due to the PTSD and migraine headaches, she was found to have an 80 percent service-connected disability), she fell into the hands of the VA, where the drugs she was prescribed for PTSD and headaches mushroomed into a toxic mix of deadly medication: Ativan, Clonazapam (Klonopin), Lorazapam; Serzone, Neurontin, Percocet, Tylenol with Codeine, Demerol and Vicodin; Serzone, Doxepin, Valium; Seroquel, Celexa, Topamax, Neurontin, Zoloft Geodon, and Celexanarcotics; Zoloft, Lithium, Buspar, and Imipramine; Dexadrine, Ritalin, and Fioricet, and Phenobarbital; barbiturates and tricyclic antidepressants. Uppers, downers – she was sedated with countless narcotics, suffering physical pain, depression, hopelessness, frequent crying spells, sleeplessness and flashbacks. In 1999 alone, according to Darla, who kept meticulous records of Kelli’s medication, 5,370 Klonopin were prescribed. She was ultimately admitted, in March 1999, into the in-patient psychiatric unit for detox due to an addiction to Ativan and Klonopin. According to Kelli’s sister, Darla, in the same year following that admission, 4,950 Klonopin were prescribed; that drug ambush continued through 2000, 2001, 2008, 2009 and 2010. Following her detox, in 1999, Kelli wasn’t experiencing any psychotic symptoms: She wasn’t manic, wasn’t hallucinating, and expressed a desire to taper off the medication. And yet, in response, she was prescribed 450 Klonopin by the VA, the very same medication that had caused her in-patient admission. Kelli began to suffer from multiple conditions, all of which were documented as possible side effects of the medication, including irritability, aggressive behavior, agitation, muscle pain, and hopelessness. So the VA – spring-boarding wildly from what should have been treated as a mild case of PTSD and migraines – diagnosed Kelli with Personality Disorder with Borderline Features. But despite the fact that it was clear that Kelli was addicted to the Klonopin, they failed to limit her means and instead dispensed even more of the addictive medication. One doctor noted in Kelli’s chart, “Would avoid narcotics if possible for the treatment of chronic pain. I also note a history of benzodiazepine dependency in the past and would use these medications with care.” The chronic pain is a classic and well-documented possible side effect of Klonopin; in response, the VA continued its Klonopin regimen. Kelli was prescribed a toxic mix of deadly medication, including Ativan, Klonopin, Lorazapam, Serzone, Neurontin, Valium, Seroquel, Zoloft, Geodon, Lithium, and Ritalin. In 2001, the VA changed their diagnosis of Kelli to Polysubstance Dependence – a dependence they created and encouraged with their continued prescriptions of highly addictive, mind-altering, psych drugs. As the drugs wore Kelli down, as she became less and less able to function, she began missing appointments, which the VA documented as further evidence of mental illness, instead of considering her lack of functionality was likely side effects of the medication. And in 2002, the VA began Kelli on a “trial” of Seroquel – highly addictive, a common drug in the toxic cocktails of soldier horror stories. In addition to other drugs – Topamax, Neurontin, Zoloft and Geodon – she continued to take Seroquel. Her condition continued to decline; she became paranoid, delusional, had hallucinations. She had numerous psychiatric admissions. She attempted suicide. And still, her medication list ballooned – maintained on the old, started on the new. Attorney Robert Haddad became Kelli’s posthumous advocate and litigated against the government, who ultimately settled, although it admitted no liability. Over the course of Kelli’s treatment with the VA, she was diagnosed with major depression, bipolar disorder, PTSD, ADD/ADHD, Polysubstance Dependence, and Borderline Personality Disorder. She was on dozens of medications, in increasing numbers and increasing dosages. She was treated by multiple doctors – both civilian and through the VA – all making diagnoses and prescribing medications. The VA, the arbiter of her medications and treatment, was content to label and pigeonhole Kelli as a psych case, and was content to administer hundreds and hundreds – thousands, even – of toxic medications to “cure” her. The cure never came. On November 12, 2010, Kelli Grese killed herself. Months before Kelli died, her sister Darla had reached out to attorney Robert Haddad in desperation, trying to find a way to intervene and halt the continuing prescriptions of Seroquel Kelli was being prescribed. Although Attorney Haddad graciously explained to Darla why he couldn’t make that happen, once Kelli died he literally, as Darla said, came to her rescue. He “hit the floor running,” as Darla described it, and gave her the breathing space she needed, as he took her place as Kelli’s posthumous advocate. His litigation was successful; the government ultimately settled, although it admitted no liability. “He’s my hero,” said Darla. And the question remains: How did this happen? Kelli Grese began in the late 90’s with a mild case of PTSD, which, following treatment by the VA consisting of psych diagnoses and thousands of medications, exploded into full-blown madness.The pattern of drugging our military personnel has become rampant and malignant. The pattern of turning a simple diagnosis of PTSD, or a physical injury a soldier sustained in battle, into a wildly escalating diagnosis of bipolar or character disorder or some other psych label – and medicating accordingly – should be a crime. Kelli Grese didn’t have to die; neither did other soldiers who have overdosed on the prescription medications prescribed by the military. My son is currently ensnared in the military’s Warrior Transition Battalion for wounded soldiers; you can read about his story here and here. Kelli Grese didn’t have to die; neither did other soldiers who have overdosed on the prescription medications prescribed by the military. A steady diet of drugs is not a treatment; the underlying condition worsens, new symptoms – most as a result of the side effects of the medications – crop up, which prompts the military doctors to slap other, largely psych, diagnoses on these soldiers. It’s a vicious cycle of diagnoses and drugs and diagnoses: Another diagnosis, another medication. It’s a cocktail of doom; it can literally drive someone crazy. In Kelli Grese’s case, it did.